After the hockey game at the Lake Placid Olympics in which the United States amateurs vanquished the mighty Soviet Union machine, the so-called Miracle on Ice which scored a metaphorical victory in the Cold War, ABC’s Al Michaels hollered the phrase that has stood the test of time, “Do you believe in miracles? Yes!” That’s how Jonathan Hock’s “Of Miracles and Men”starts, sure, of course it does, but it’s not just the same old-same old, an unimaginative director resorting to the most conventional footage of a massively-chronicled event. And this is because much later in the film he replays the footage with the accompanying Soviet broadcasters. They are glumly straightforward. “Team USA win over our hockey players,” they say before routinely signing off. Ah, miracles through the looking glass the other way. It is most effective in its earliest passages, illustrating not only the rise of Soviet hockey but its conception. It was constructed and funded and supported, of course, to demonstrate Soviet might to all those who opposed their way of living, yet another in a virtually un-ending line of examples that it’s not (retch) “just a game”. It was, however, constructed not as a mirror image of the hockey played by its Canadian founders but as an entirely new style of play, a style in which its architect, Anatoli Tarasov, “believed in freedom, respecting his players as individuals.” Those individuals functioned as a united collective, an utterly profound juxtaposition that simultaneously rejected and embraced its own nation’s ideals. The Lake Placid loss was defined, in part, by Tarasov being reluctantly dismissed as coach and replaced by dictatorial Viktor Tikhonov, a man whose bizarre decision to remove goaltender Vladisav Tretiak from the Miracle on Ice game after giving up a couple goals contributed mightily in sealing his squad’s fate. On camera Tretiak is incredibly diplomatic regarding the decision, as are his teammates. They are diplomatic about the loss itself, resigned to their fate even as they continue to express dour disbelief over the outcome. The doc’s framework is great Soviet defenseman Slava Fetisov returning to the scene with his daughter in tow. She asks her father “Do you remember this?” His response may be monotone but, God, you can still feel the sting, palpably, across the decades. “I remember it,” he says. If there is a villain to be found in “Of Miracles and Men” it is not the upstart Americans but the Red Army coach himself, Tikhonov. His replacing Tarasov was, it is said, akin to an artist being replaced by an accountant. Worse even, when considering the tight-lipped, closed-off regime Tikhonov implemented, one that kept his players away from home for 11 months a year. They stayed in army barracks but seemed even more like the KGB, the team, in a twist of irony so perfect it’s almost unbelievable, that Tikhonov coached before accepting management for the national squad. Tikhonov’s empire becomes the symbol of the Soviet empire, summarized by Russian journalist Vitali Melik-Karamov when he explains that “revolutions give birth to romantics. The Soviet regime first appeared as a romantic notion. Then it transformed into fanaticism. Later...society became cynical. Tarasov was romantic but Tikhonov was a cynic.” That’s probably simplified, and a bit pollyannaish, but no less apt. 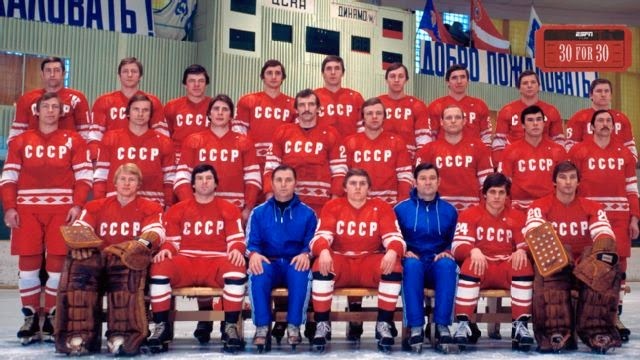 Even as Soviet hockey success continued throughout the 80’s post-Lake Placid, the impetus for its downfall was already brewing from within. And the grand irony is that this downfall under the grip of Tikhonov inadvertently helped spur a revolution of its own, one that eventually saw its players – like Fetisov – become the first Soviet citizens to travel freely between the west and east, to become symbolic individuals in a society that sought to repress them. Their “game” aided change. All due respect to Herb Brooks’ and his twenty players, but that’s a miracle.